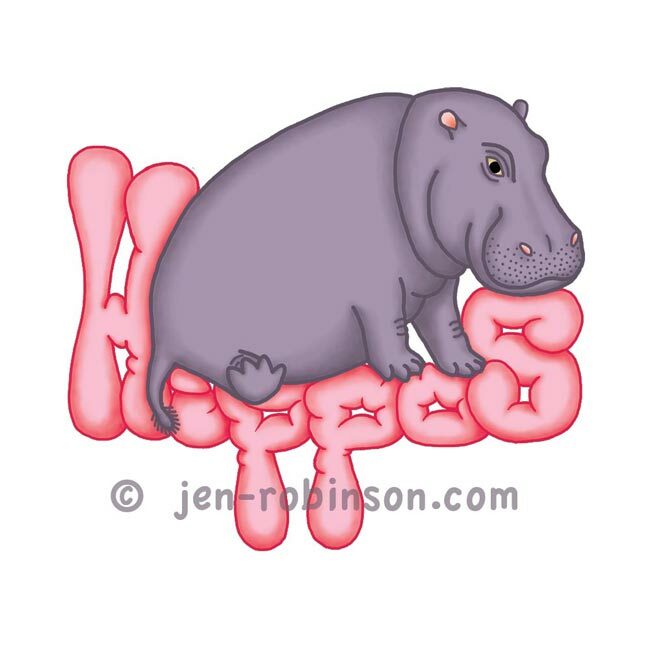 I have just uploaded a new hippo design to my Redbubble shop. 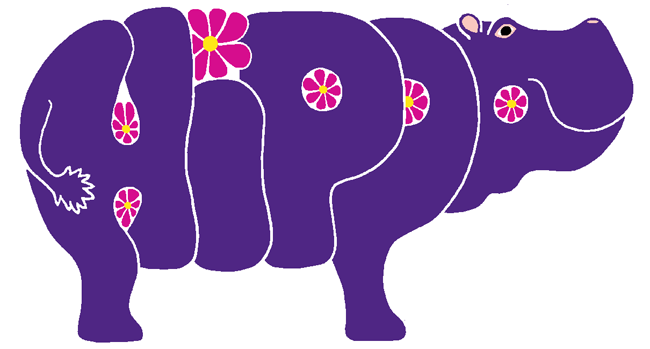 There are four different versions of the same hippo to give you a choice of colours. They are all available on a multitude of different tee-shirts, sweatshirts, other clothing including children's, plus a lot of other products too. Just click the individual versions to see what products it is available on. There are many more colours and styles of clothing than are shown on the linked page. Please visit my Hippopottermiss portfolio page to see what other designs I have available too. I found out that yesterday, the 21st of June was International Day of the Giraffe. I wasn't aware of it but guess what I was modelling?... 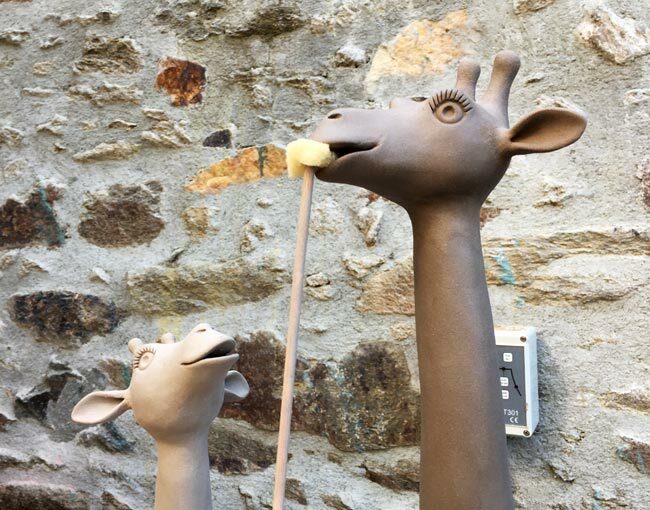 The little giraffe is wondering if her big brother is eating something nice... ( no, it's a prop until the clay has hardened enough for his head to not sag). 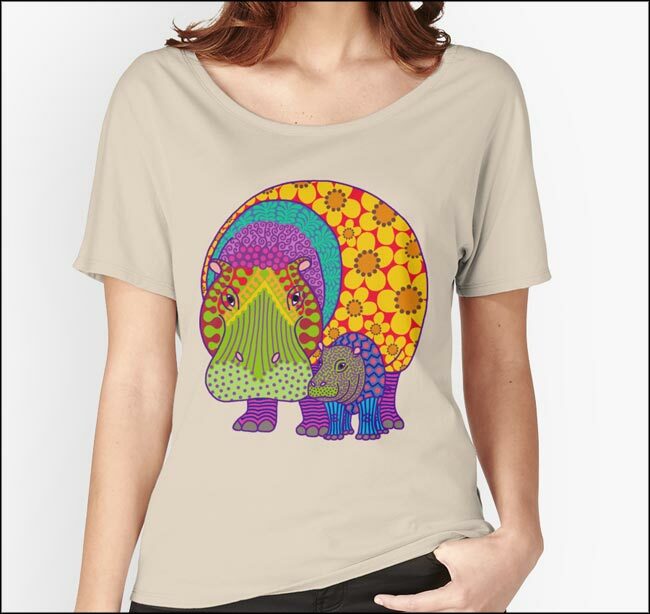 My newest T-shirt designs are now available in my Redbubble Hippopottermiss store. 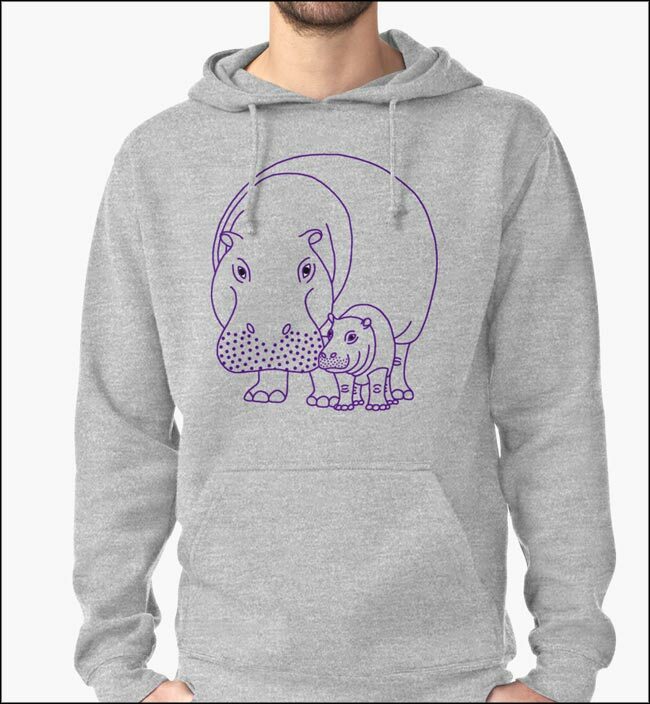 They are two versions of the same idea, "Mommapotamus & Baba" with just the outlines for those who prefer a more sober design and Hippiepotamus & Baba for those who like lots of colour to brighten up their lives. 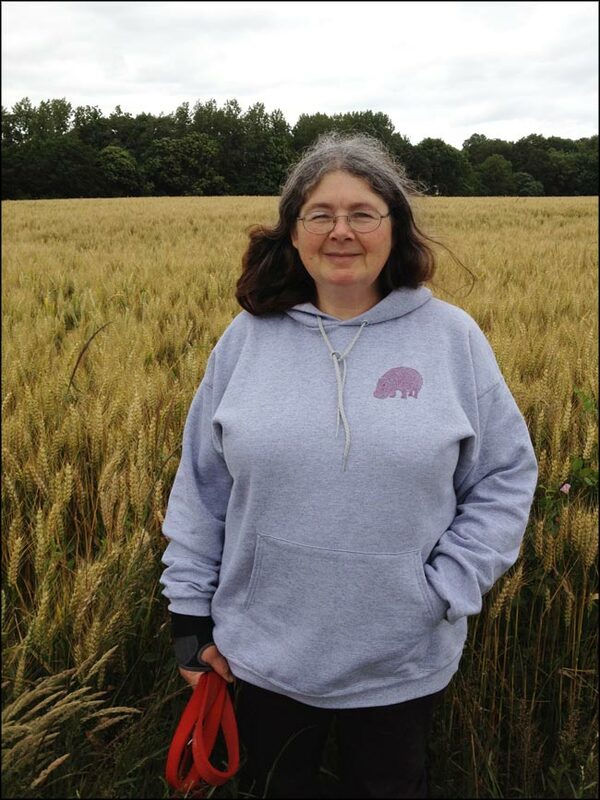 The above design is available on a large range of T-shirts and sweatshirts in lots of colours and sizes. You can find it here. 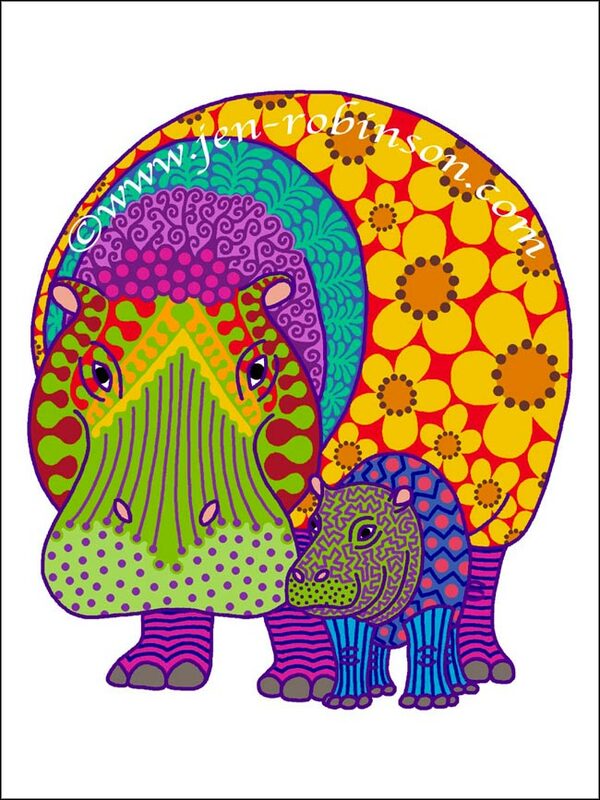 This psychedelic momma hippo with her baby is available on a large choice of mens and women's tee-shirts, sweatshirts and hoodies in my Redbubble Hippopottermiss store. You can buy it here. 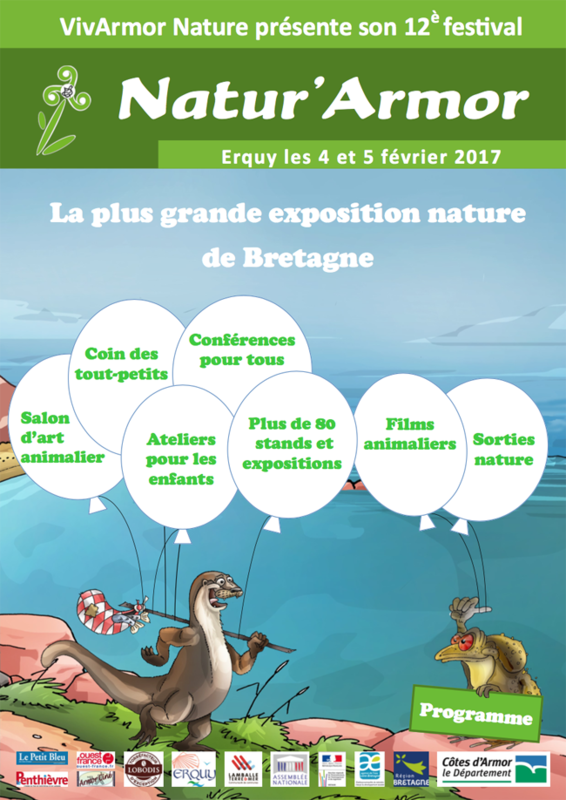 Very soon, the 4th and 5th of February, it will be the regional nature festival Natur'Armor, which this year is being held in Erquy in Côtes d'Armor here in Brittany. Included in the festival is an animal art exhibition in the municipal art gallery attached to the tourist information centre. You can find me there doing a modelling demonstration. Information (in French) can be found here the art exhibition runs for a week before and a week after the festival, finishing on Sunday 12th February. 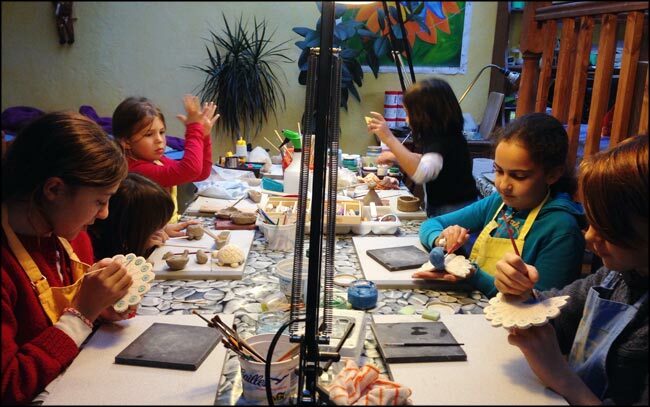 With the addition of a new girl who has joined us after the autumn half-term school holiday, my children's clay modelling class is now full. The three more experienced girls decided a few weeks ago that they wanted to make peacocks. Here they are decorating them with underglaze colours before glazing and a final firing. I visited Portland in Oregon in the USA for the annual Hippolotofus reunion in September. 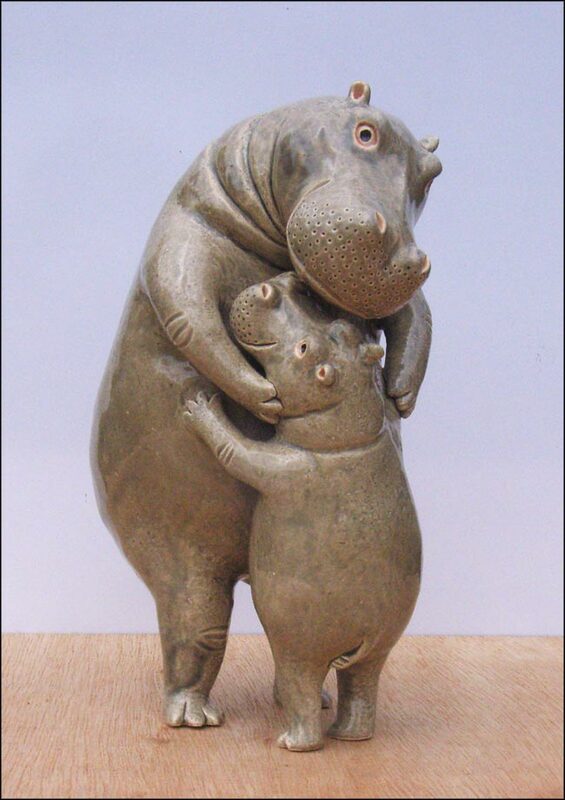 Hippolotofus is the intenational group of hippo lovers and hippo collectors. 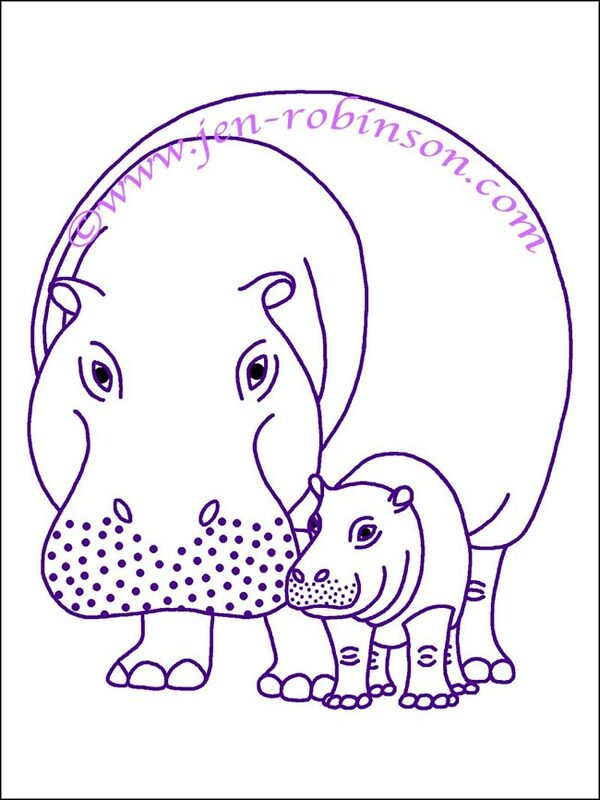 There is a link at the bottom of my hippo gallery page if you're interested in finding out more about the group. Of course a whole bunch of little hippos wanted to hop into my suitcase to go too. After the reunion weekend I went with two hippo collector friends to the nearby Oregon coast for a few days. I have now added the Pacific Ocean to the oceans that I have paddled in. 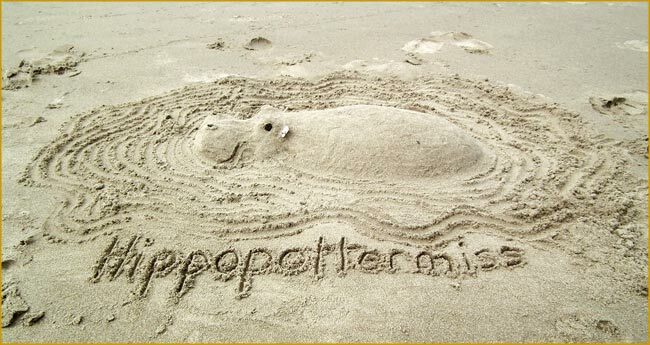 Whilst there I just had to make a sandhippo. I wonder if anyone saw it before the tide washed it away. 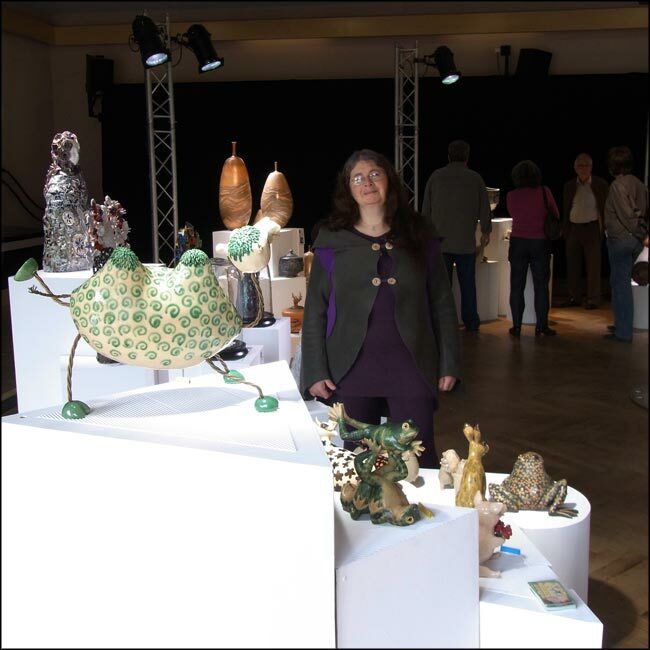 In June I exhibited my work at the Festival International d'Arts Nature Coeur de France, which is a nature art festival at the Château d'Ainay-le-Vieil in the middle of France. It included paintings/drawings, photography and sculpture, and there was some fantastic work on show. 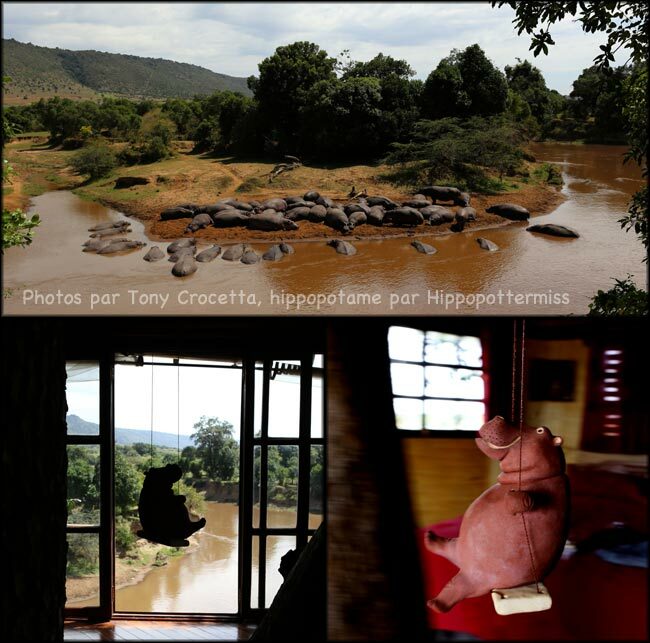 One thing that made me ridiculously happy was that one of the special guests, photographer Tony Crocetta, who runs photo and art safaris in Kenya, bought one of my hippos to take out to the Masai Mara game reserve in Kenya. He now swings in the porch of Tony's lodge, overlooking a bend in the Mara River that has a large resident pod of hippos. How wonderful! 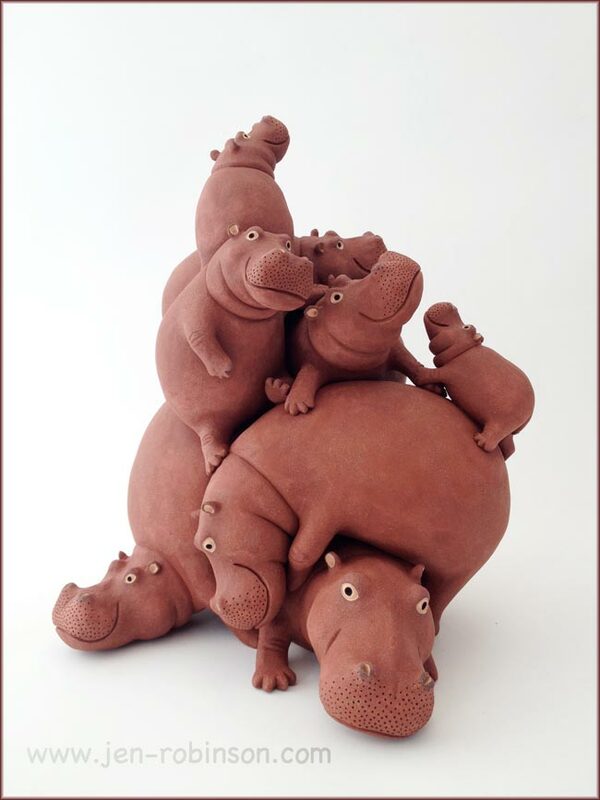 My sculpture "Hippopotapile" is the biggest pile of hippos that I've made so far. 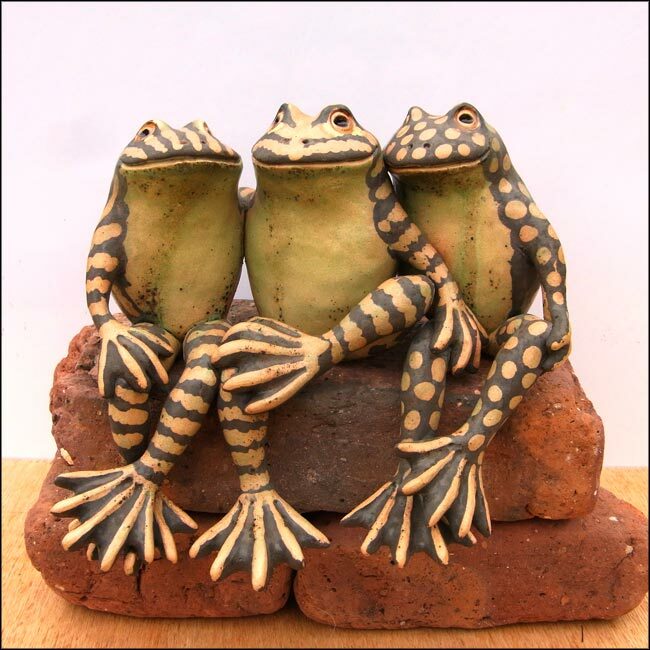 They are hand-modelled in dark brown stoneware clay. 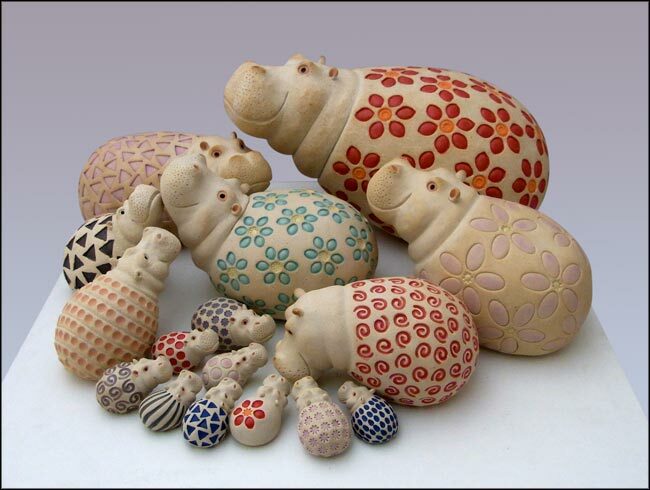 With a long, controlled drying period so that they dried evenly and didn't crack, then a gradual firing to 1200°C they survived well, with only a small crack appearing on the back of the bottom hippo. Someone said to me that they are the happiest sculpture they have ever seen. I wish you all a very Happy New Year 2014. It is with regret that I have had to cancel my participation in the Rendez-Vous des Naïfs this year. I hope to be there next year. I am now able to do some modelling but my wrist still not good enough for glazing so my latest new designs are all unglazed stoneware. 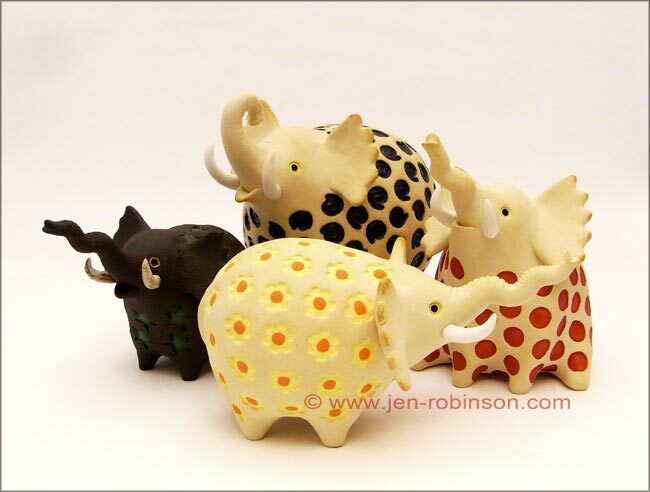 I have a new elephant design "Nellyflumps". I've been trying to get this one right for a while and quite like the result. 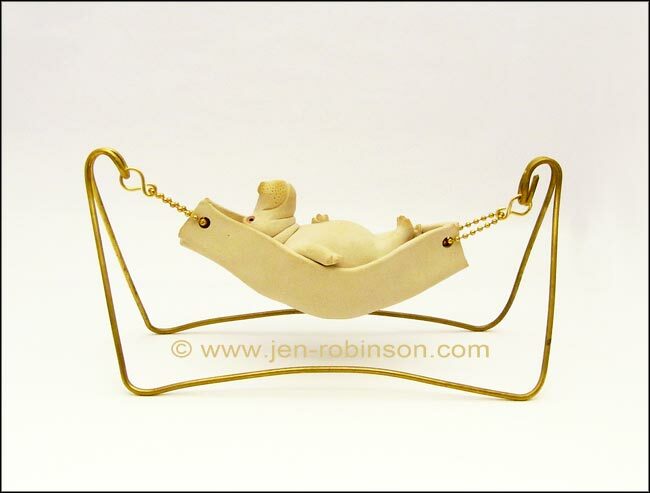 I've also been making new hippos, including a hippo relaxing in a hammock and some hippos on swings. 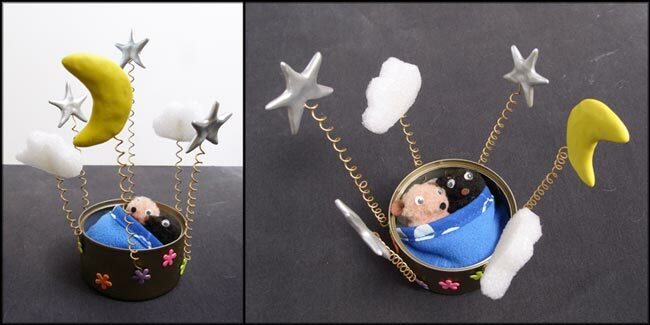 They can now be found in the Artisans Créateurs shop in Dinan, France. 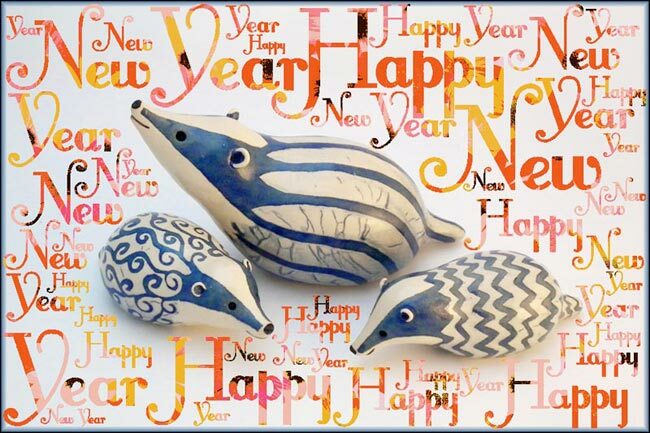 I would like to wish all my customers and visitors a very Happy New Year. May it bring you all the things that 2012 lacked. 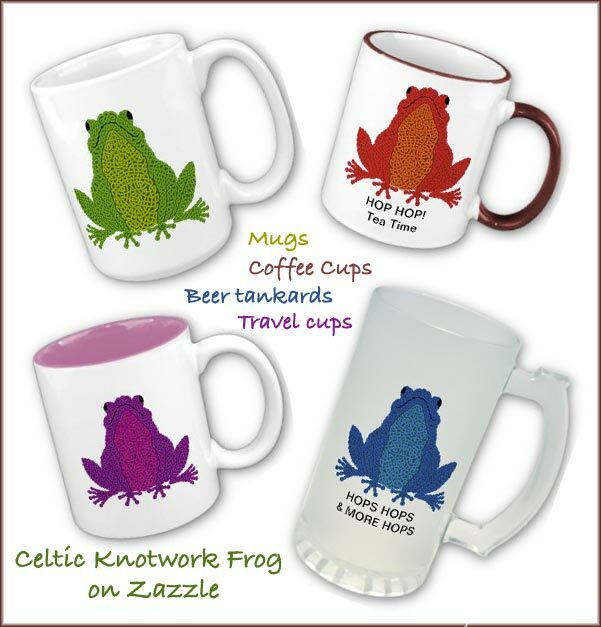 This is my new celtic knotwork frog design, which is now available on tee-shirts and mugs in my Zazzle store. 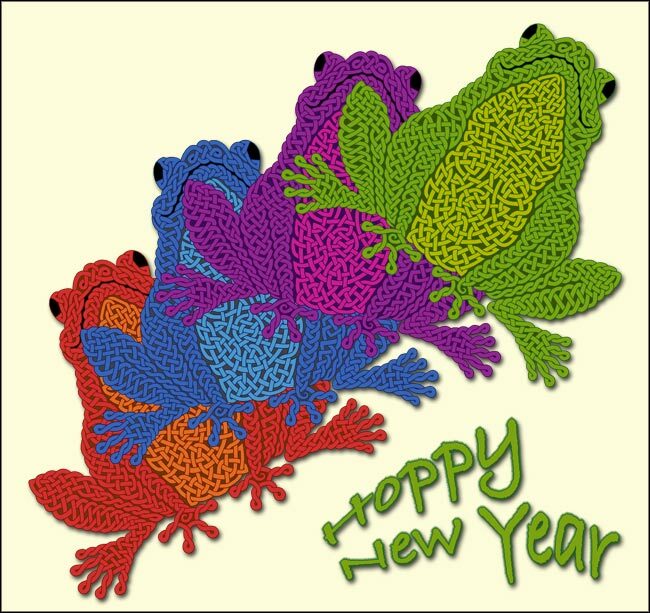 There are four colours of frogs which can be put on a multitude of different coloured tee-shirts, sweatshirts etc. They go up to big sizes on some models. If you like, the tees and mugs can be personalised with the text of your choice too. The red one was chosen for the "Best of the Day" selection in the french store on the 4th January. My three giraffes (featured below) were chosen as a deviantART Daily Deviation on the 5th December. 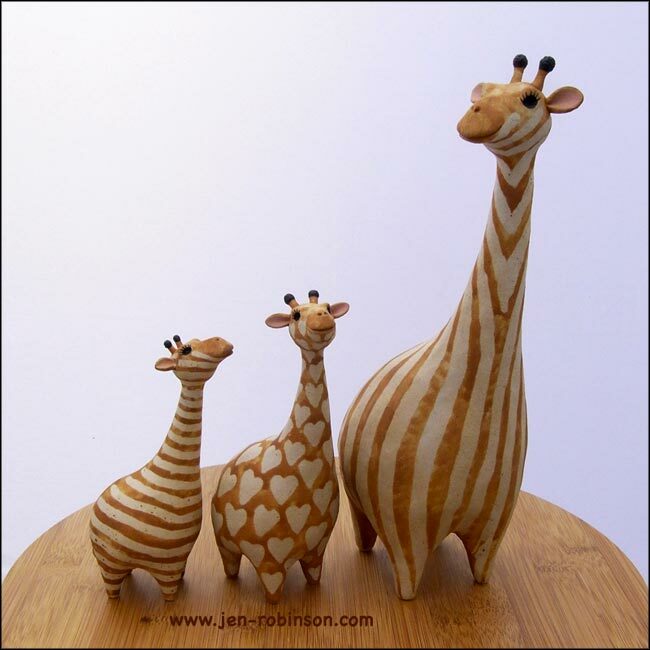 3 stoneware giraffes were waiting patiently until I could decorate them. They are delighted with their new coats and have gone to show them off in the Artisans Créateurs shop in Dinan. For the occasion of "Insolites Mondes d'Artistes", a Côtes d'Armor art initiative, a temporary exhibition "Bijoux et Matières" is currently running at the Artisans Créateurs shop in Dinan from 9th to24th November. 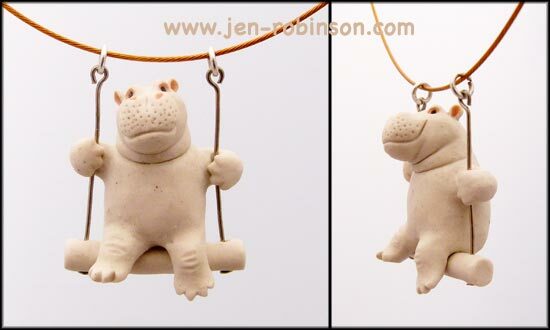 and some miniature stoneware hippo necklaces that I made specially for the occasion. 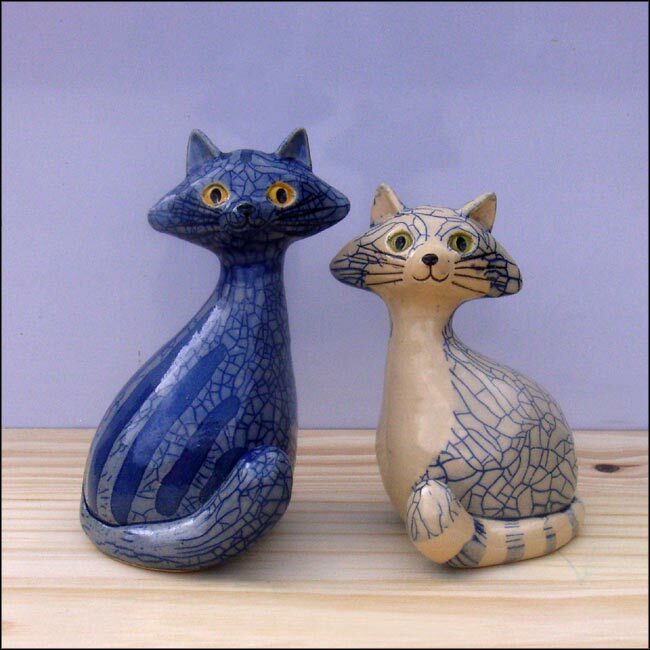 They are all hand modelled in different coloured stoneware clays, with just as much detail as the bigger ones - a challenge when they are so small.! 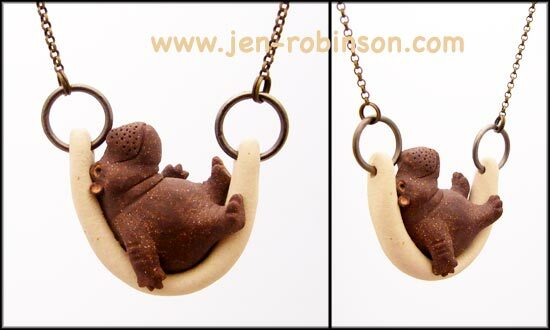 Hippo on a swing, hanging from a bronze coloured tiger tail necklace. 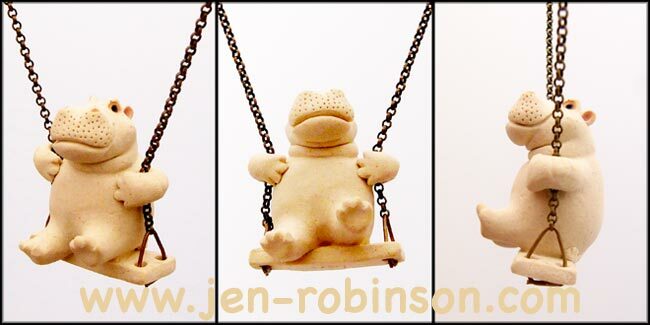 Another tiny hippo on a swing with a silver chain. 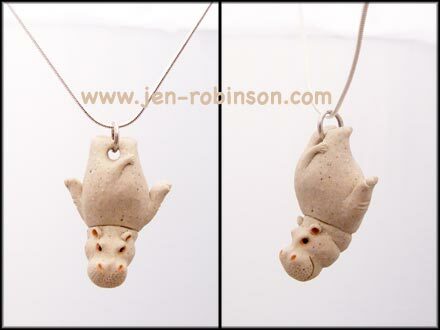 This hippo gymnast must remember watching the olympics! He has a black metal ball chain. 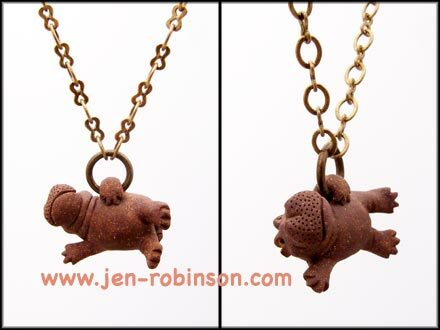 A fancy bronze coloured chain sets off this acrobatic hippo very nicely. 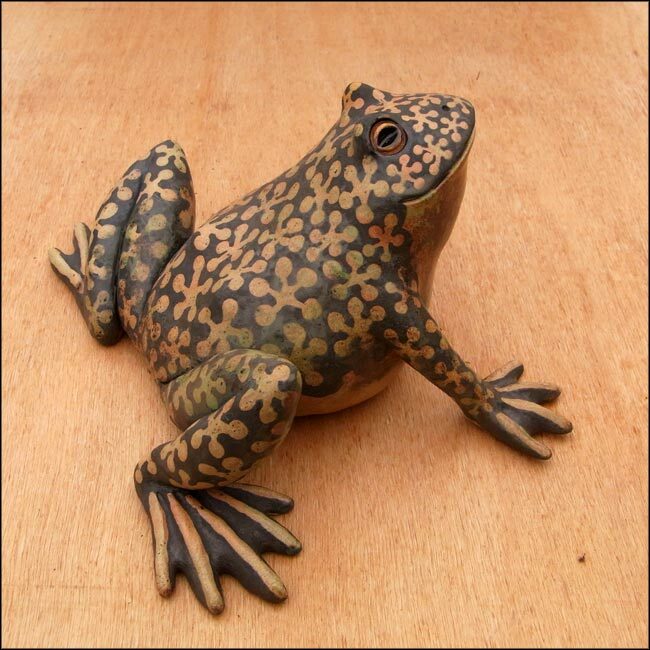 He is hand modelled in brown stoneware. 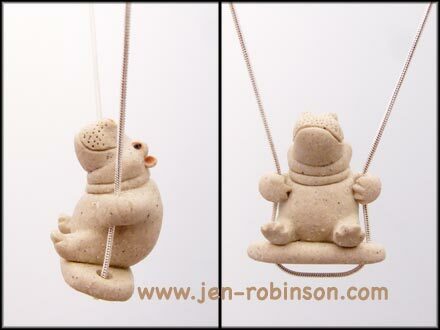 Hippopotamus trapeze artist - and he has no net! 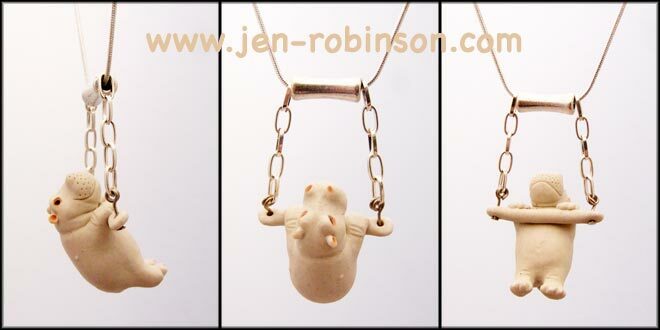 Hippo playing on a swing necklace with a bronze coloured chain. 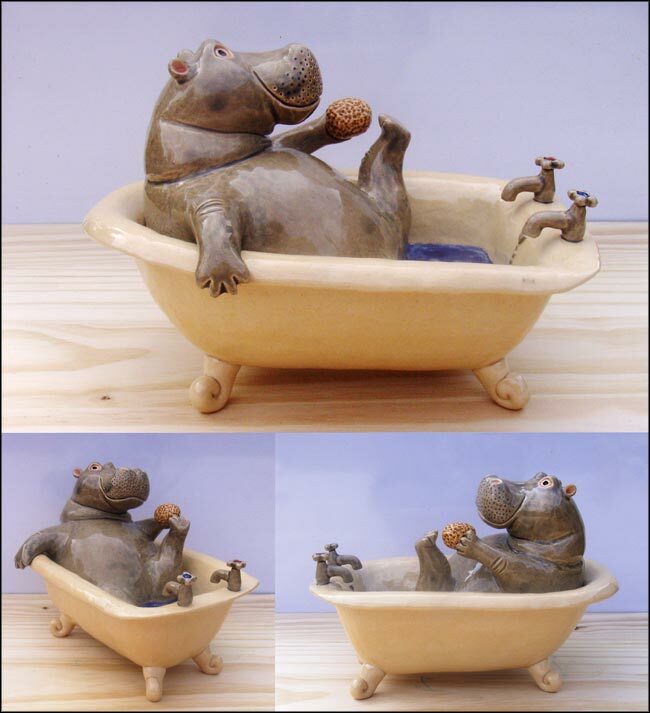 This hippo is relaxing after watching the exertions of the others. Hand modelled in two different coloured stoneware clays. He has a bronze coloured chain. 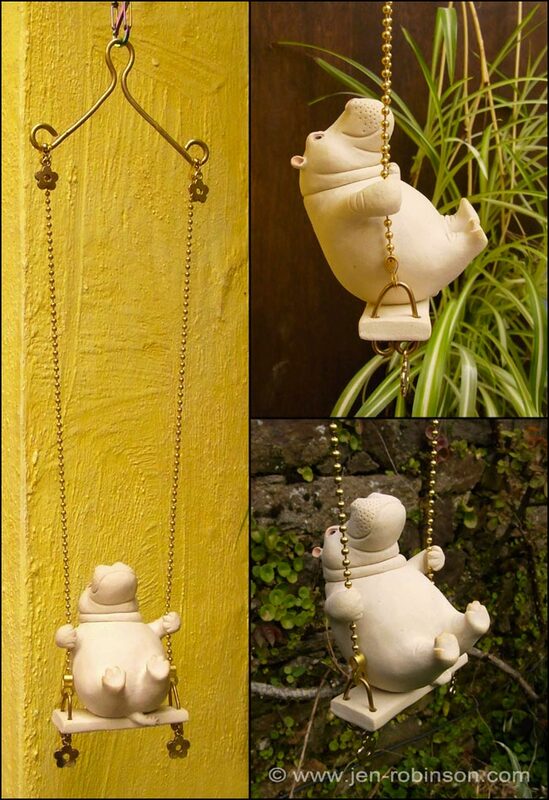 It looks easy for this happy hippo to hang on by one arm. He dreams of reaching the stars and becoming the best circus hippo . His swing is hanging from a copper torc. 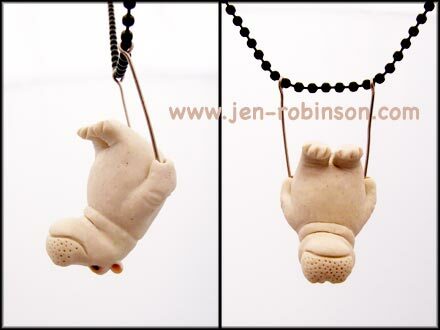 Miniature ceramic hippo acrobat hanging on a black leather necklace. 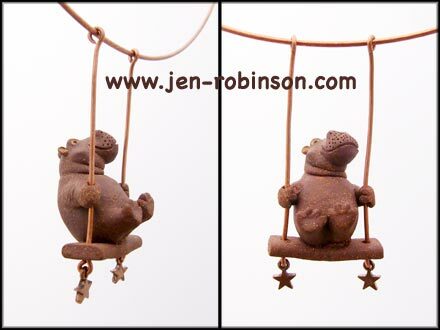 Mr hippo is just waiting for you to push him on his deluxe swingwith a silver chain. "Look! 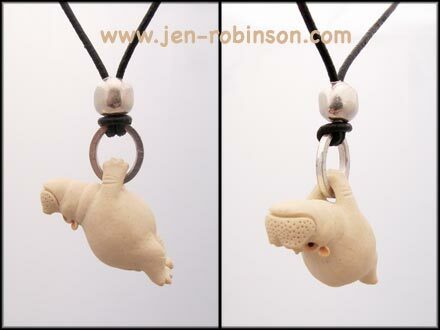 I can hang on by my feet" - says the little hippo gymnast hanging from his silver chain. 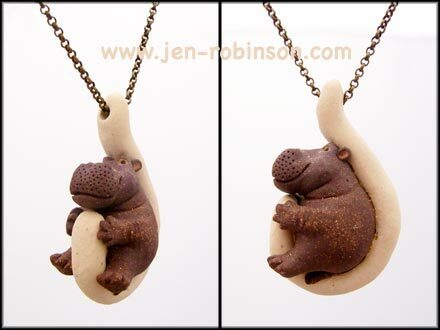 This happy little0 hippo is a bit timid and prefers holding on tight while he gently swings from his bronze coloured chain. 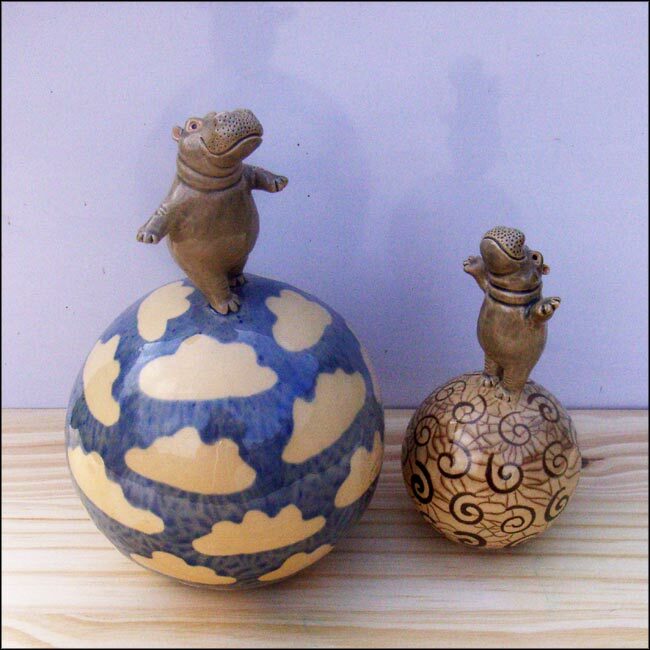 Made with brown and off-white stoneware clays tat can be worked together. I had a great time at the Hippolotofus annual reunion in Denver. 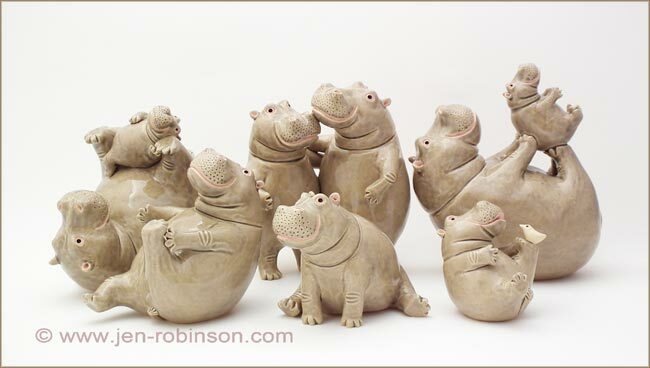 My small stoneware hippos went down very well with the hippo collectors, and it was a real pleasure to see everyone wearing the official reunion tee-shirt that bore my design. Thank you to everyone who made it such fun. I will post some photos next week. I haven't applied for any exhibitions or stalls this autumn in order to be able to concentrate on my order list as soon as my wrist is better enough. Please excuse my absence. I have a problem with my wrist which I injured in a fall. It is improving but only very slowly. 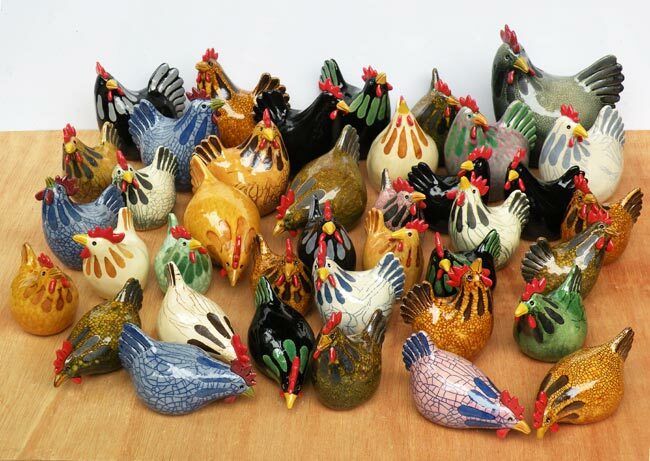 I particularly want to apologise to my customers who have placed orders and who are being very patient. 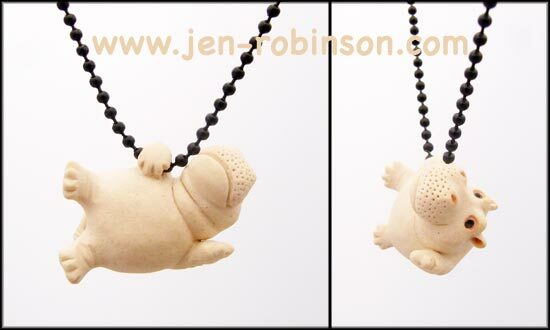 I can still only work with small quantities of clay, and not for very long at a time. I now have physiotherapy sessions to help me regain the lost movement and the pain will gradually disappear. Thank you for your patience. 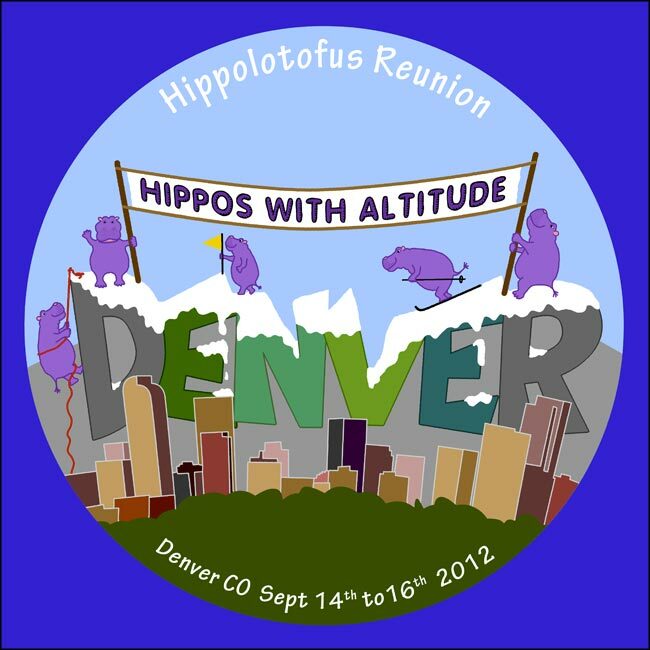 I leave soon for Denver, Colorado in the USA which is the chosen city for this year's Hippolotofus reunion. I'll be meeting up with old hippo collecting friends and meeting some new ones too. This year I entered the contest for the official tee-shirt for the reunion and I won so I'll have the pleasure of seeing everybody wearing them for our outing to the zoo on the Saturday. 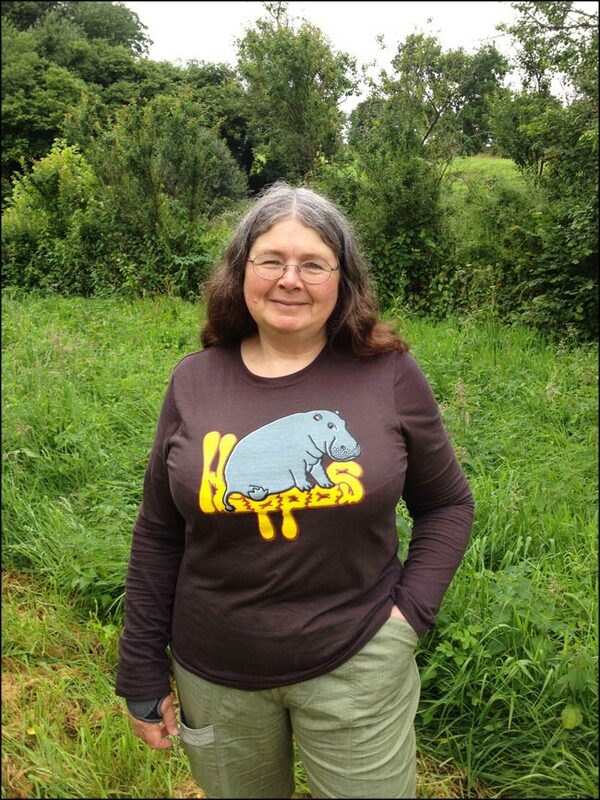 I'll be taking with me my "Heavy Hippo" tee-shirt which is available in five colours and a multitude of styles and colour of tee-shirts. 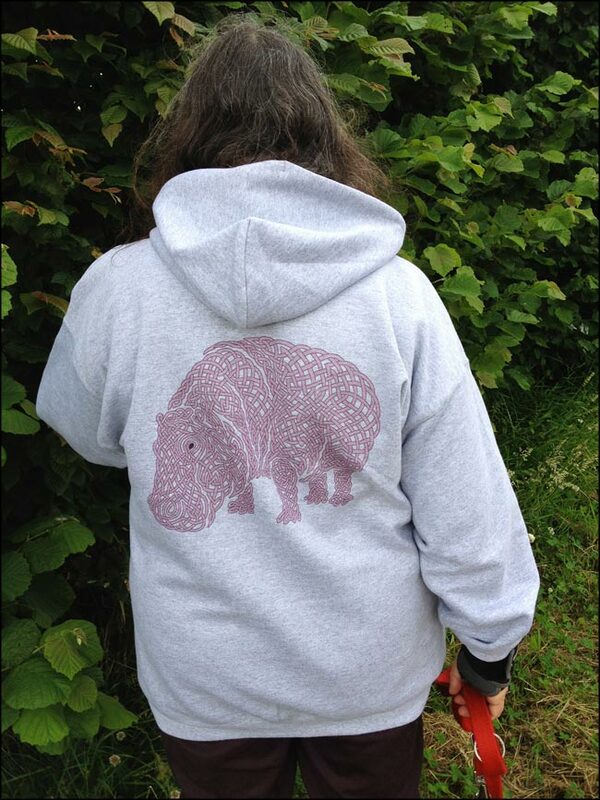 I'm also taking my knotwork hippo hoodie which has a small hippo on the front and a big one on the back. 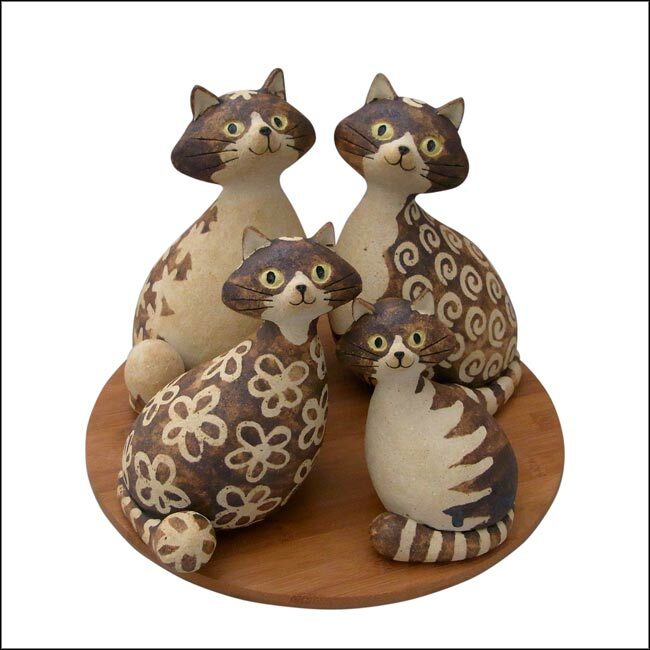 Garden cats - A new frost-proof version of my cats designed to be able to stay outside all year round. 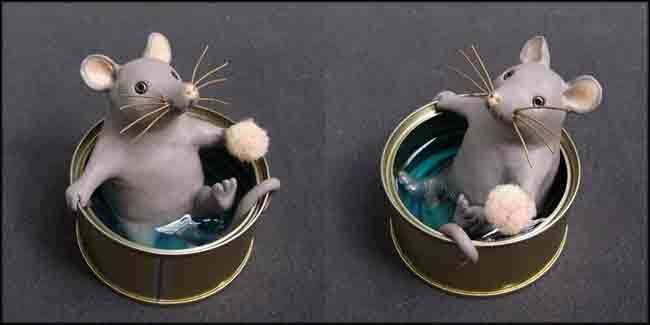 Hand modelled, like all my animals they are made in stoneware fired at 1280°C. 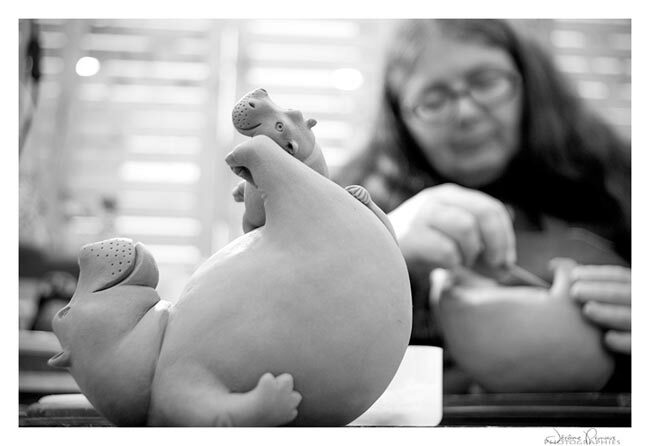 My new stoneware decorated garden hippos will be on sale at the Village Mouffetard ceramic festival. They are frostproof and can be left outside all year round. 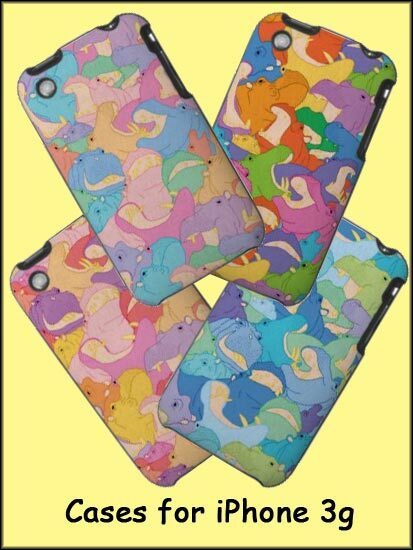 Redbubble have now introduced cases for the iPhone4 & 4S, iPhone3GS, and iPod Touch 4G to their range. 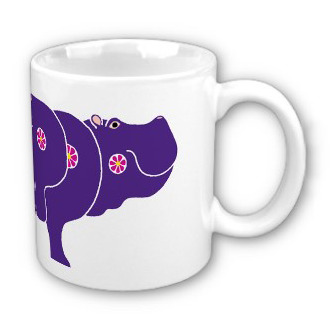 You can now buy them with my Happy Hippos design . I bought myself one and am very pleased with both the look and the quality. 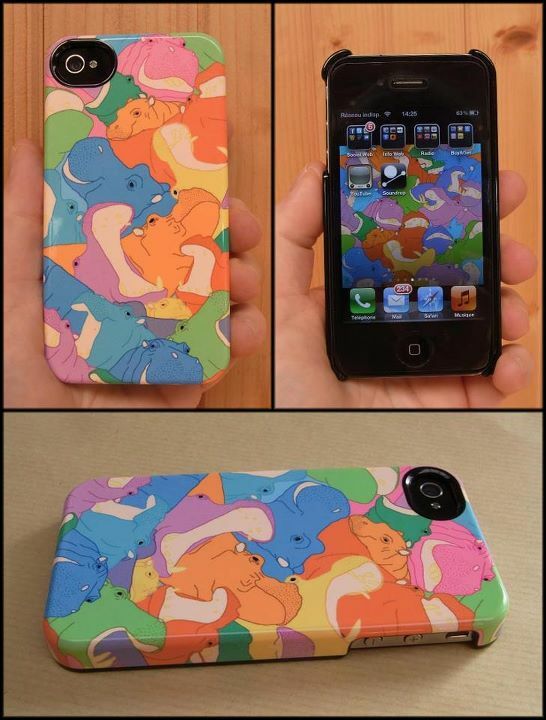 The ideal accessory for any hippo collector with an iPhone. Not got one? 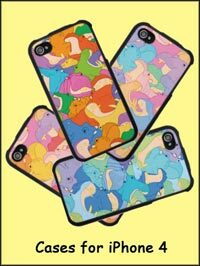 Maybe Redbubble will soon bring out cases for the Blackberry and other phones. I'm using the same design as wallpaper on my phone. 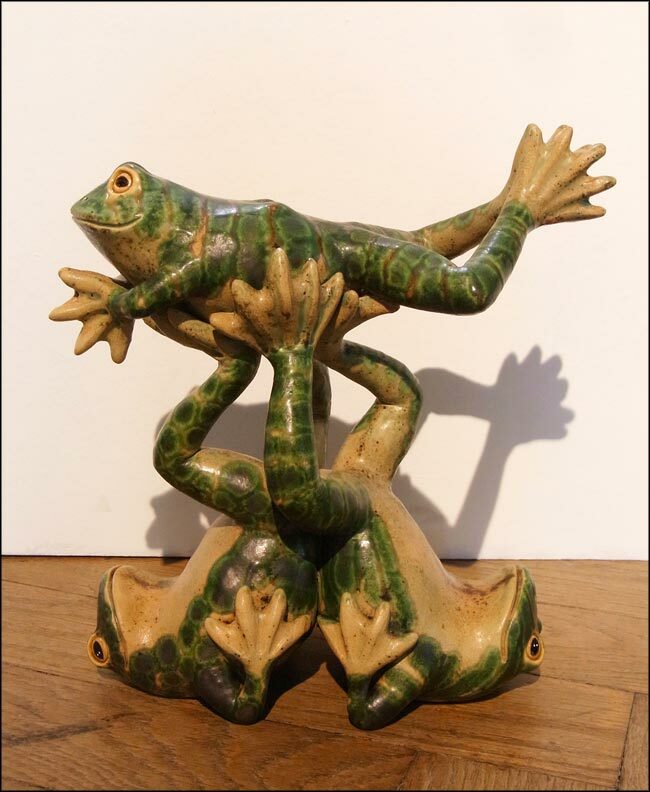 I'm back from the 6th Contemporary Ceramics exhibition at pont de l'Arche near Rouen, which was a success. 11 ceramic artists, each with their own style. 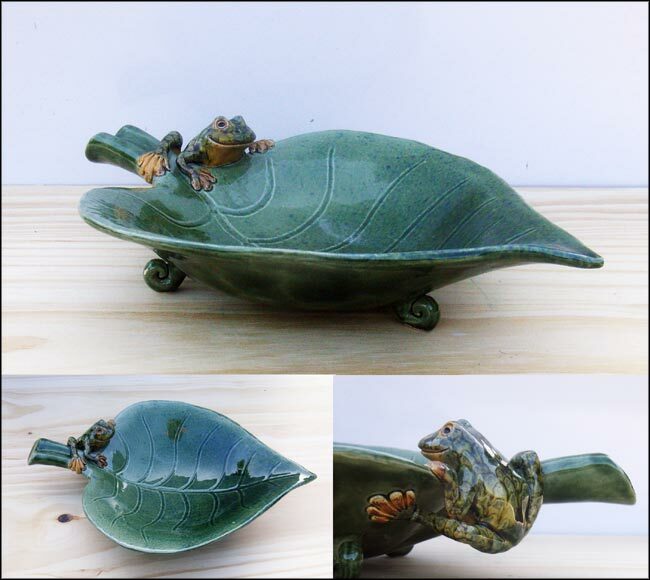 There were sculptures both complex and pure lined, and magnificent thrown pots. The visitors were numerous and admired it all, sometimes staying a long time. They asked questions about the clay, the firings, or our sources of inspiration. Some of them went home with an addition to their collection, or simply something they fell in love with. 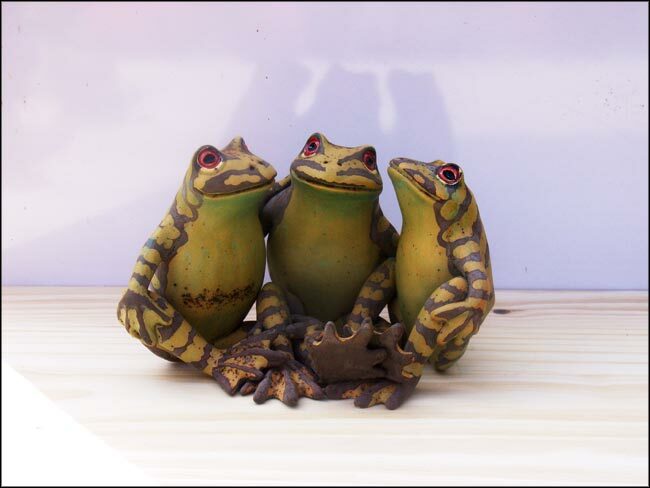 Amongst other things I made some new frogs. I was pleased with how my combinations of slip clay and glazes turned out. 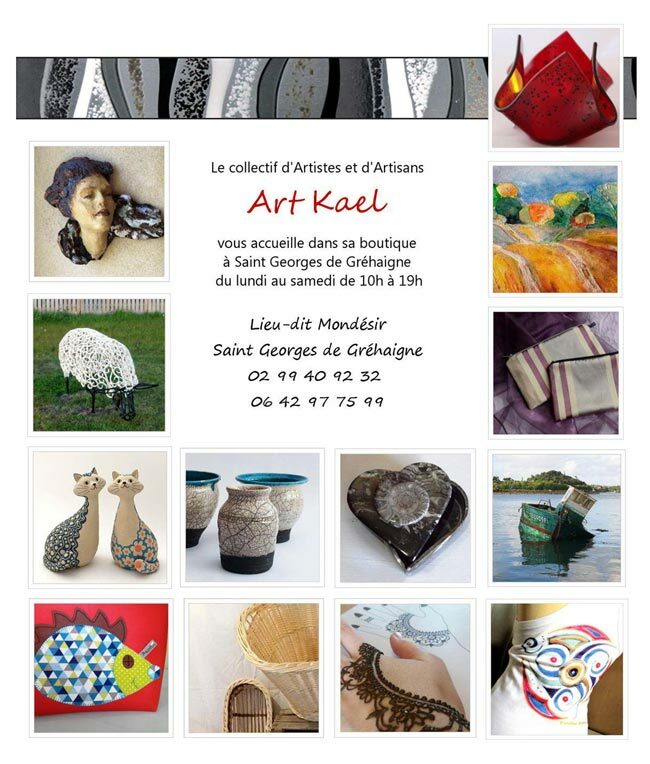 which is being held at the gallery L'Artmateur in Plouër sur Rance until the 25th April. The titles are all word-play which doesn't translate - sorry! The exhibition will be repeated over the summer. 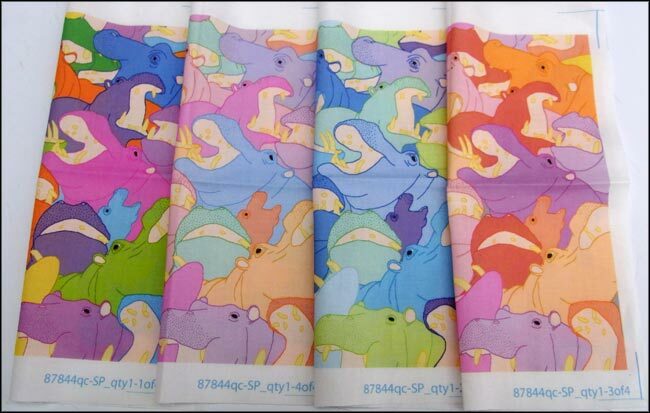 My latest design on Zazzle.com is"Flower Hippo"
My "Happy Hippos" fabric isnow available on Spoonflower. 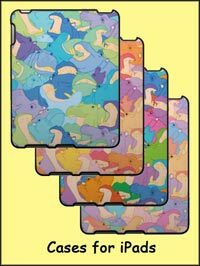 I've designed a multicoloured repeating hippo square that is destined for several products to buy online. 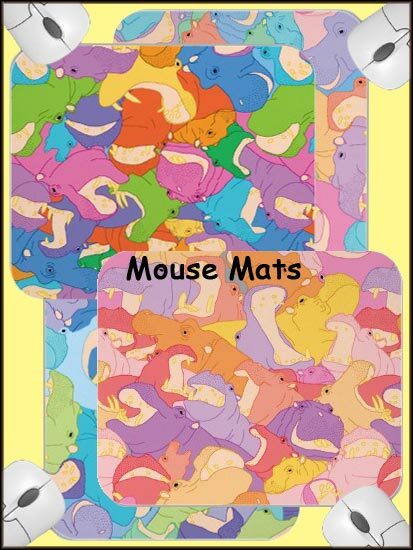 I have just made it available in four different colourways and on four different products on Zazzle. It will soon be available on Spoonflower the fabric printing site. I've uploaded the files and am waiting for my test swatches to arrive so that I know it prints correctly. 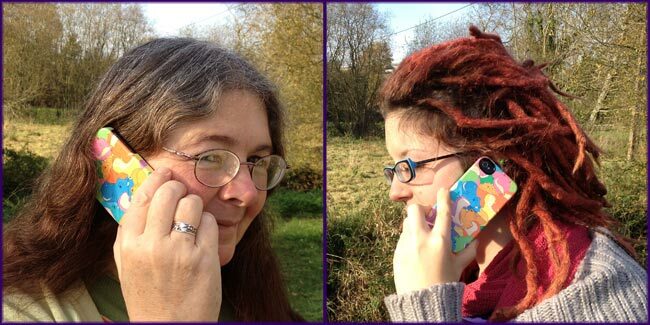 Choose your colours and get creative! 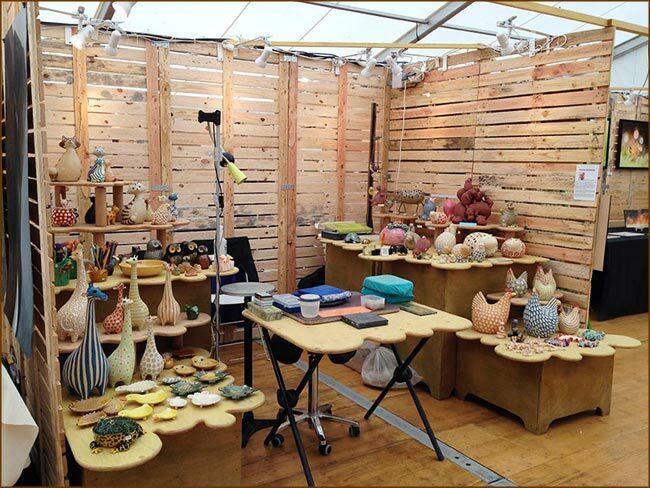 I have just got back from a ceramics festival in Village Mouffetard in Paris. 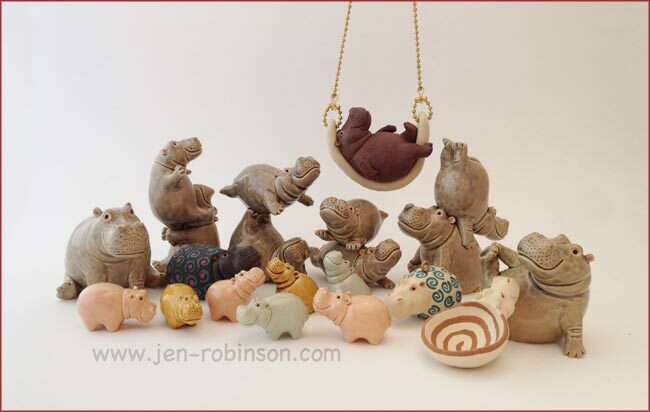 I worked hard to get a batch of hippos finished to take with me and it was worth it as I sold a lot of them. 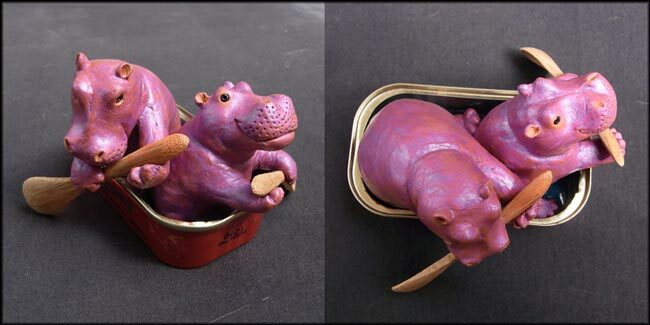 I had two hippos ordered and one very nice one that sold to one of my regular hippo collectors before I even reached Paris. He collected it on Saturday from my stall. It is called "The Hug"
Dr Richard Leaky and National Geographic's appeal for support for Wildlife Direct.